High blood pressure (a.k.a. hypertension) is defined as a systolic pressure (the first number in a blood pressure reading) of 140 mm Hg or greater and a diastolic pressure of 90 mm Hg or more. There’s been a recent study done suggesting that developing this as a senior (between the ages of 80 and 90-years-old) will help protect a person from dementia while also reducing frailty and disability. This is different from what studies have suggested about people who develop high blood pressure in their middle age. Those studies suggest that doing so will boost your risk of developing dementia, heart attack, and stroke later in life. There are several factors that may be able to explain this apparent association. The main one is that as people grow older, it’s necessary for blood pressure to grow higher so their brain can continue to function properly. Another possibility is that blood pressure drops when dementia sets in. Researchers say this may happen because a person’s brain cells begin deteriorating. If this is true, anyone who’s elderly and doesn’t have dementia is likely to have high blood pressure. While age clearly matters here, there is still no definitive cause-and-effect link between high blood pressure and dementia. This information also doesn’t necessarily apply to those who are really old, which is the fastest part of the population today. As such, it’s still important to understand how a person’s risk for mental decline changes over time. It’s also important to understand there are at least two different classes into which high blood pressure falls. Blood pressure issues aren’t something that only effect older adults. Younger adults also face them and when left untreated these can cause damage to their heart, kidneys, eyes, and the blood vessels in their brain too. Another class is that which is known as “late-life hypertension.” This is typically driven by neurological mechanisms causing brain distress. Many believe that a person’s body responds by trying to relieve the distress by improving their blood flow. Some also believe that herein lies the reason why treating late-life hypertension doesn’t reduce dementia. In fact, about 40% of patients experiencing this did continue on to develop dementia. However, there is research showing that developing high blood pressure after you turn 80-years-old means you’re 42% less likely to develop dementia when you’re in your 90s, especially when compared to people who had normal blood pressure. This rate continues to rise because those who developed it after they turned 90-years-old were 63% less likely to develop dementia. Studies show that this link remains present even if patients take blood pressure lowering medications. What’s interesting is that these findings seem to echo what other studies have discovered about a person’s risk for developing dementia. For instance, there are some studies showing people over 75-years-old are less likely to develop mental dysfunction. As such, nobody completely understands how this association works, which is why it’s important to do further research so we can gain a better understanding of the cardiovascular system and the brain. 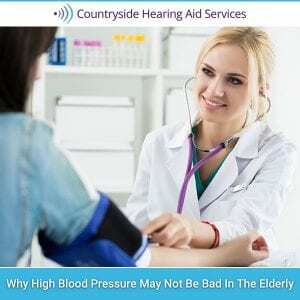 This is something that Countryside Hearing Aid Services supports as they’re truly concerned about their patients – a large number of whom come from the elderly population today. They want to encourage you to maintain good heart health and to also take the time to get your hearing checked on a regular basis. This is important because they believe your best years are yet to come and they want to make sure you enjoy them.